Typical of thousands of amateur stations are these two breadboard radios. 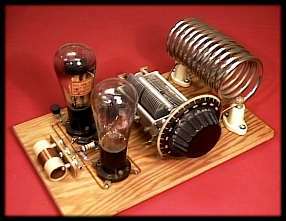 Most home made receivers used the infamous 201A tube which was one of the most versatile tubes of the 30s. and was used by many amateurs as is depicted in this sample of a budget receiver. Plug-in coils, (centre right) allowed band change operation from 40 to 160 metres. 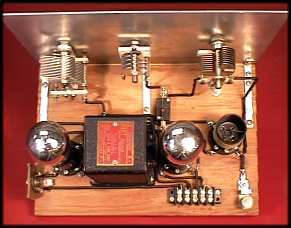 A common home brew transmitter would find a pair of 245s producing about 10 watts of A1 CW on the 80 and 160 meter bands. Those amateur radio operators who had the budget for high quality receiver, may have opted for the RME69 from Radio Manufacturing Engineers of Peoria Illinois. 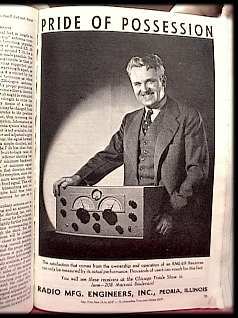 The RME-69 advertised its high end receiver in the June 1938 issue of QST. the RME 69 was the most famous Model in the RME line-up. RME was responsible for the R in RST having a meter calibrated in R units from 1 to 5 to reflect readability. Other manufactures started calling their meters Signal Strength meters and so the S unit was founded. 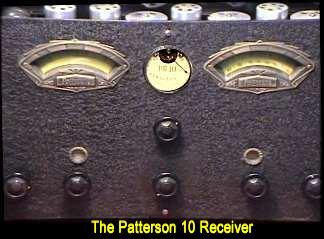 Another high end period receiver was the Patterson PR-10. The craftsmanship of the tuning dials escutcheon plates was typical of construction throughout this receiver. The Hammond Museum of Radio features dozens of additional models from Hammarland, National and other manufacturers of this period in our radio communications history. The content on this site will continue to grow so please, pass the word and revisit us often.